I realize it’s a bit strange to make sorbet in the middle of winter. But this is southern California and cold is a very relative concept around here (it was actually the recent rain that was bothering me). However, winter also is lemon season (the fruit schedule from the farmer’s market claims that lemons are year round but I only see them in winter). I actually missed Meyer lemons the first time they appeared at the farmer’s market as I thought I had a bunch of lemons at home that were given to me by a coworker (turned out they were actually limes). Angela and I were showing a friend of her family’s around and we went to Huntington Beach. It just so happened that they were having a farmer’s market that day and there was a vendor selling Meyer lemons. Given that I had passed them up the first time, I decided to snap them up while they were around. Neither of us had had Meyer lemons before. They don’t really grow on the east coast (where ultimately we are from). I had, however, heard of their near-mythical flavor which is what drew me to them. It doesn’t hurt that Angela loves lemons. While there are other lemon vehicles out there, none are quite as pure as sorbet. 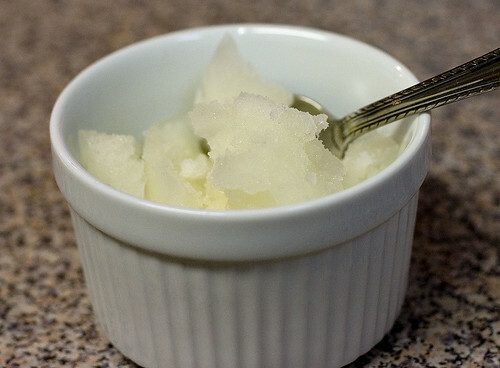 Plus I had a recipe for Meyer lemon sorbet. The sorbet is almost full proof to make. My only problem was I didn’t have quite enough for a full recipe. The sorbet was quite good. I find the less bitter flavor of Meyer lemons to be significantly better than Eureka lemons. It was a cleaner flavor. Angela thought that it could use to be a bit sweeter so you may want to add additional sugar in the future (and you think that’s a recipe note but it’s really a note to myself). I also think I’d replace the vodka with Limoncello next time. And some kind soul left some home grown Meyer lemons in the kitchen area at work. I may have taken a few more than my fair share but I’ll put them to good use. 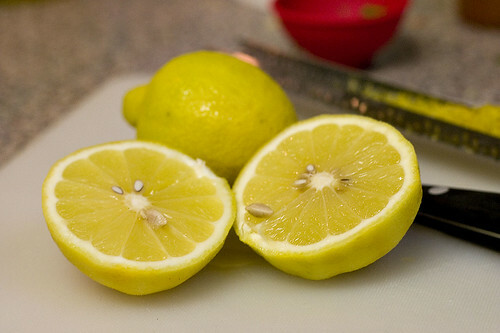 Place the water, sugar, and lemon zest in a small sauce pan. Stir over medium heat until the sugar has completely dissolved. Cool to room temperature. Stir in the lemon juice and vodka into the water mixture. Chill the mixture thoroughly in the refrigerator. Strain the mixture through a sieve and freeze in an ice cream maker according to the manufacturer’s instructions. Place in the freezer until ready to serve. It’s a bit yellower in real life but not a lot. It’s pretty much just light yellow. It’s not the vodka: that only prevents it from freezing as hard. I don’t know why it’s that light. It may just be the that the lemon juice wasn’t particularly yellow.